Friday is Fashion Revolution Day, in remembrance of the 2013 collapse at Rana Plaza, which killed thousands of garment workers in Bangladesh and injured even more. From that terrible tragedy, a worldwide movement began in an effort to improve the conditions of these workers, while also striving to change the fashion world for the better. On Friday, as we did last year, participants will wear our clothing inside out to draw attention to those who made it. It’s important to know where your clothing comes from, because in many cases, its makers are living in poverty and working in dangerous conditions. Things have begun to change since the Rana collapse in 2013, though more change is desperately needed. Fair trade and ethical brands are dramatically increasing, and large companies are taking steps to improve their working conditions. Fashion Revolution’s goal is a five-year plan and we are just getting started. This year, the campaign is asking, “Who Made My Clothes?” as a way to encourage consumers and companies alike to dig a little deeper into the production process of their clothing. If you love a specific brand, take a moment to inspect the tag or email the company and ask. Companies want to please their customers, and if more of us start asking questions and demanding answers, we can get their attention. Wednesday, I’ll share a few of my favorite ethical stores and highlight ways to shop more responsibly. As I try to show in my regular posts, ethical fashion doesn’t have to mean a radical change in your shopping habits, but can simply come about with small changes here and there. 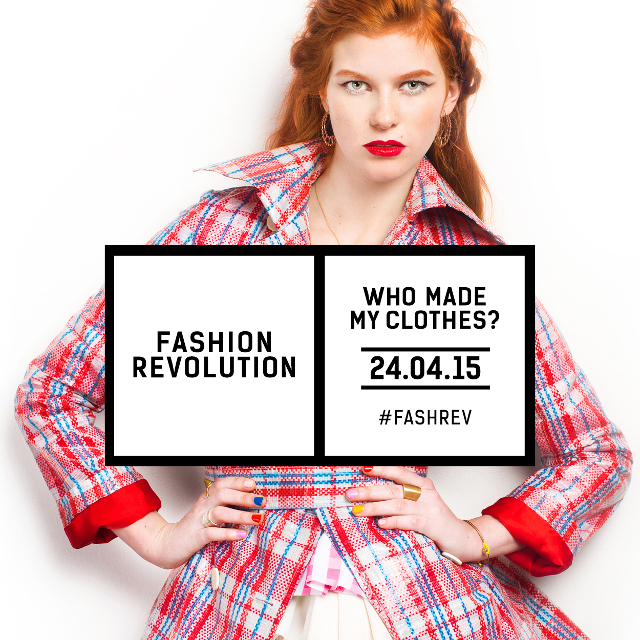 I hope you’ll stay tuned and consider participating in Fashion Revolution Day this year. And here’s my post from last year, the first year of the campaign. I saw your tweet about Target’s new line! I think this is a really effective slogan — it’s a simple question but carries a lot of weight. Definitely! I think it draws attention to the subject without beating you over the head.